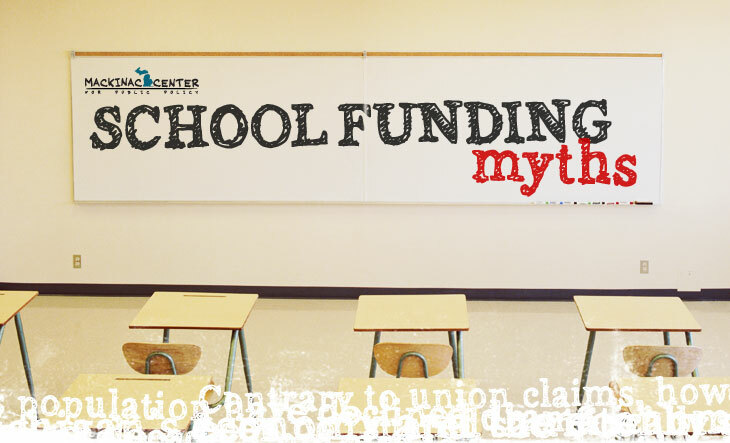 This continuing series examines common myths about Michigan school funding. The foundation allowance is not simply a grant to each district — it is just one of many school revenue sources. Most districts get about $7,000 per student through the foundation allowance, but the statewide average revenue from all sources is almost $13,000 per pupil. School employees on the whole have not saved taxpayers money through contract concessions and have remained relatively shielded from Michigan's economic downturn. Michigan's teachers are the nation's highest-paid when compared to state wealth. Michigan school expenditures have nearly quadrupled since 1960. As measured by personal income, Michigan devotes more state and local tax revenue to schools than any other state besides Wyoming and Vermont. For the past century, funding for public schools has moved in one steady direction – up. Despite some policies that make school budgeting more difficult than it needs to be in Michigan, school funding has proven to be remarkably stable. The school finance reform initiated under Proposal A in 1994 significantly reduced funding disparities, and today 80 percent of Michigan school districts get between $7,100 and $7,400 per pupil through the state. Increased federal revenues and other categorical funds have also worked to level historical funding differences. Over the last 15 years, the portion of total school revenues from the state sales tax and the state-run lottery has steadily decreased. In 1995, they contributed 32 percent and 5 percent, respectively. In 2010, they’re expected to make up just 21 percent and 3.5 percent of all school funds. Reducing class size is often promoted as a surefire way to improve student achievement. Yet class size has been declining steadily both in Michigan and nationwide for decades with no corresponding improvement in outcomes.